Please find impressions of the first acoustex in our picture gallery. Be inspired by new solutions and ideas at acoustex. An extensive supporting programme provides new input. Test the presented products, services and innovations directly on site and try them out as you like. 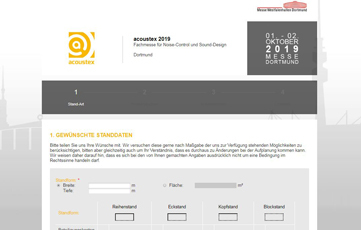 We are pleased that you would like to be an exhibitor at acoustex 2019. Simply register quickly and conveniently online now or download the registration documents. How much does it cost to be an exhibitor at acoustex? Find out here what a row, corner, head or block stand costs and discover our convenient complete stand packages. The progress of scientific findings and technologies has also resulted in greater expectations of society in respect of the environment. 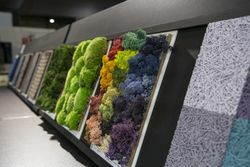 For example, not only acoustically effective buildings and rooms, low-vibration and nice-sounding products but also low-noise means of transport and traffic routes are in high demand. acoustex now exactly fulfils these needs and exciting challenges in the noise control and sound design areas. It thus fills an obvious gap and offers all involved experts an annual communication platform. 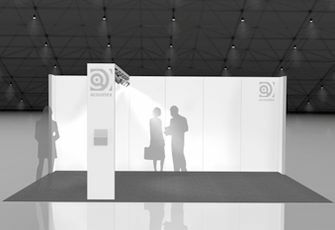 Furthermore, the acoustex trade fair is an important meeting place for future buyers and consumers due to its market offer from the application areas of architecture, industry and traffic and due to the wide range of acoustically effective products and solutions.